Note1: You can download and test this version from "CTCenter->Update Manager" and select CT "Development Version"
What Is LAB CT version ? Last edit: 1 week 3 days ago by Sternas Stefanos. I attached a small project made in CTLAB 6.80. The units "Classes" and "SysUtils" are not found, if I press Alt+Up. Other units e.g. "Forms" are found. This problem is only with CT6.8 32 Bit on Win7 32 Bit and on Win10 64 Bit. CT6.8 64 Bit doesnt have the problem. Older problems persist, I see no change. It is probably not dependent from the project. With projects in Codeocean it happens also. The project compiles and works ok.
Last edit: 2 months 1 week ago by Peter Heckert. The problem vanished, when I rebooted on both computers. Usually I reboot my home computer (Win10 64 bit) only once a week. Inbetween it goes into hibernate and quite often Codetyphon and other programs stay open over night. Possibly thats the cause of the problem. I was unable to reproduce it. 2 months 1 week ago	#13113 by Matis A.
where have the X-buttons on editor-tabs gone? I miss these because it's very complicated now to deal with the tabs. Middle Button Click onto the Tab closes the Editor Window. 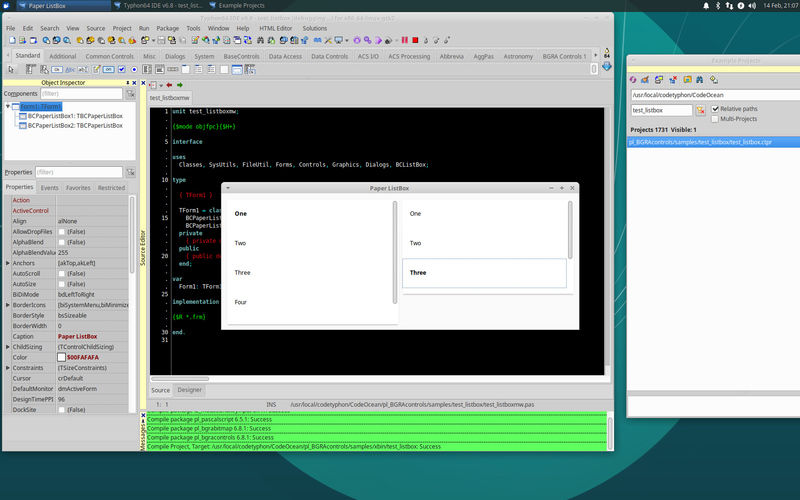 If you right click in the Editor window and choose "Options->Pages and Windows" and you can configure the behavior. The checkbox for the Close "X" ist there, but it cannot been selected. 2 months 1 week ago	- 2 months 1 week ago	#13121 by Matis A.
Typhon IDE use only native API elements from supported platforms. Last edit: 2 months 1 week ago by Matis A.. 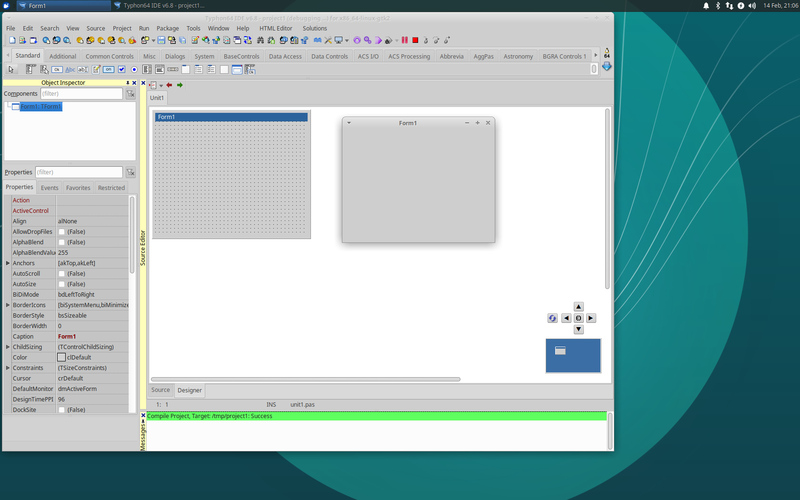 I have now several times successfully installed CT6.7 or CT6.8 under Xubuntu AMD64, but it is not possible to compile an empty project. The application crashes immediately. 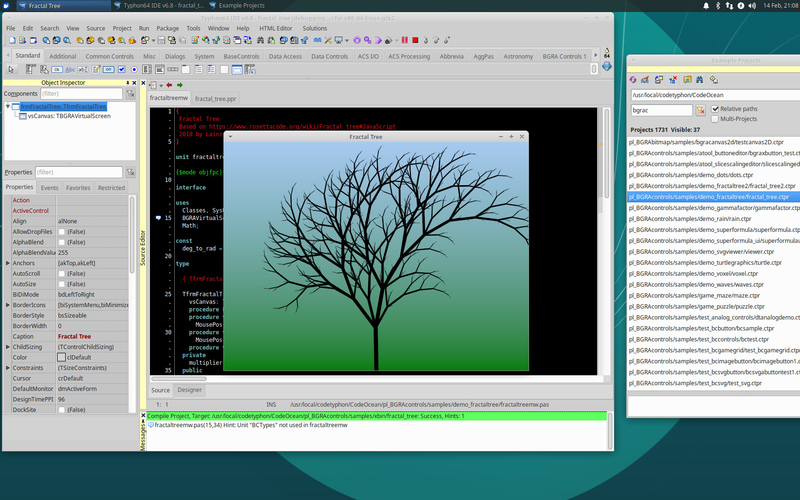 With CT6.6 everything runs smoothly on Xubuntu AMD64. Win7_64 has no problems with CT6.7 or CT6.8. I hope you can locate the bug. 2 months 1 week ago	- 2 months 1 week ago	#13131 by Matis A. -Did you install System Libraries ? -Your PC RAM etc ? After the installation, I get the message that everything went well. 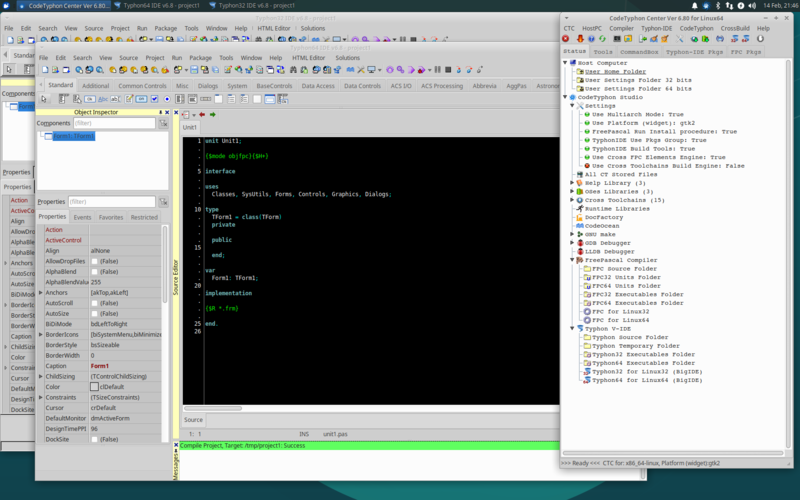 But can not compile a project without the IDE crashes. 2 months 1 week ago	- 2 months 1 week ago	#13133 by Matis A. 2) We install CodeTyphon LAB 6.8 with the default procedure more info (screen 1). 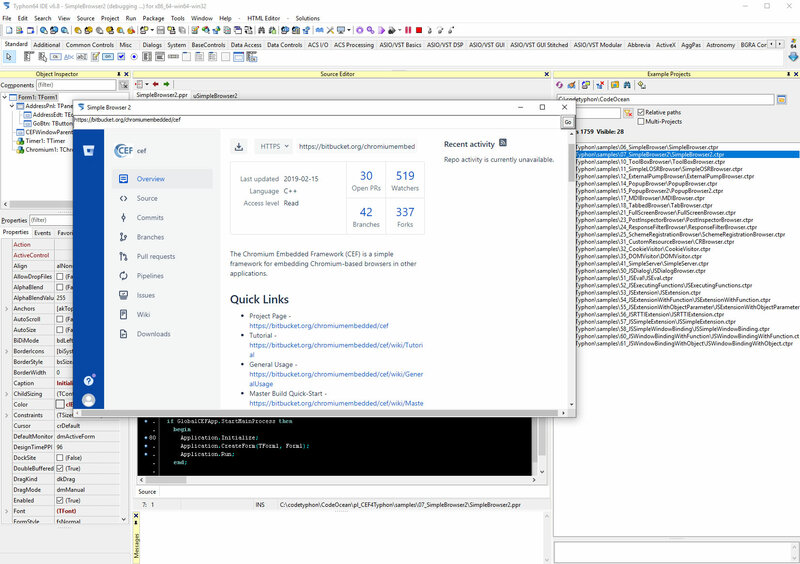 Now we are testing MultiArch CodeTyphon Installation. PS: According our lab logs, we test CodeTyphon 6.70 before Final Release on Ubuntu 18.04.1 LTS and Ubuntu 18.04.1 LTS MATE. 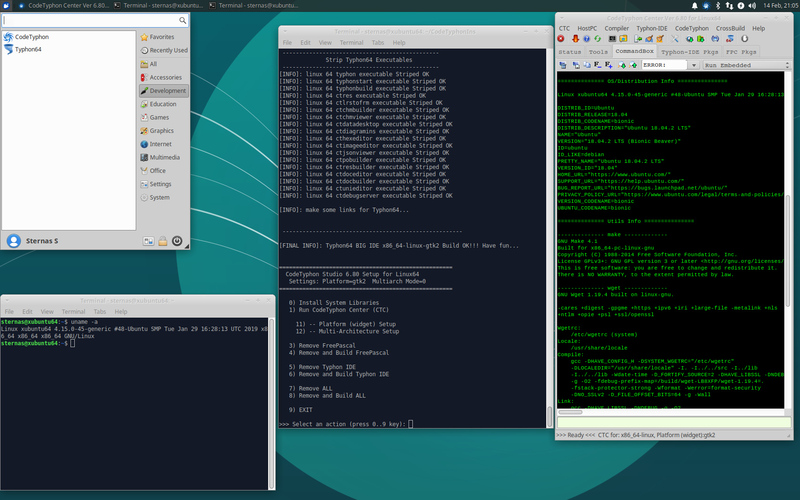 Tests on Debian 9.7 and Fedora 29 are Default GO-ON-GO Release Tests. 2 months 1 week ago	#13136 by Matis A.
because this version also meets all requirements. In a few days I will perform a new installation. Server Side Pascal it's a fact !!!! I want to say a BIG thanks to FreePascal Team for this new technology. Last edit: 2 months 6 days ago by Sternas Stefanos. Screen1: SimpleServer : HTTP and websockets server with CEF for communication between applications in localhost. Last edit: 2 months 5 days ago by Sternas Stefanos. 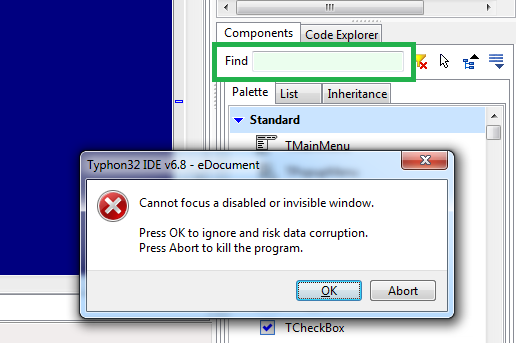 Found a small bug In CT6.8 Typing enter while find components is empty shows an error "Cannot focus a disabled or invisible window." CT6.8 32bit on Windows 7 64bit. I made an (intentional) small testproject. Then a new problem turned up, see the screenshot. Both breakpoints look as if they have triggered, but the program did not stop there, I got this result without any interaction. 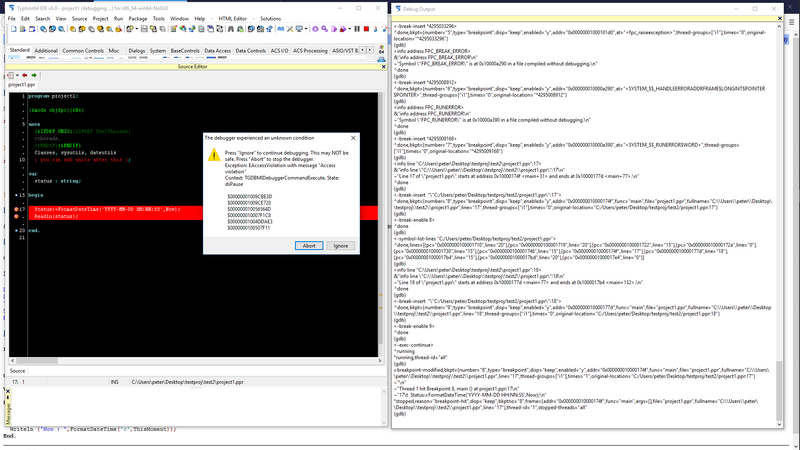 The debugger Output says: Stopped at line 17, but it has not stopped. 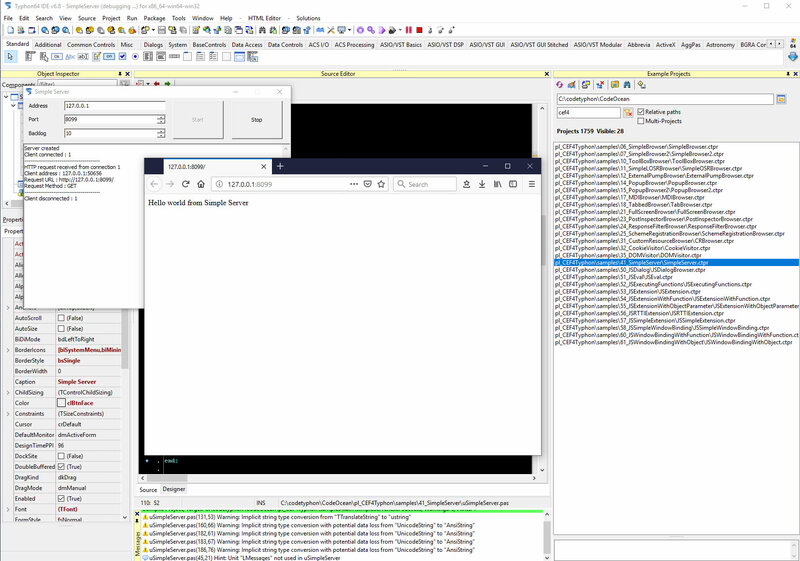 When I continue the program then the red squared Stop button stays red and only "Reset debugger" turns it ino the gray inactive state. I am on WIN10 64 Bit. The problem appears with Typhon 6.8 32 bit and 64 bit. The exception window appears only in CT 64 bit, not in CT32 bit. This error happens with default -O1 optimization. 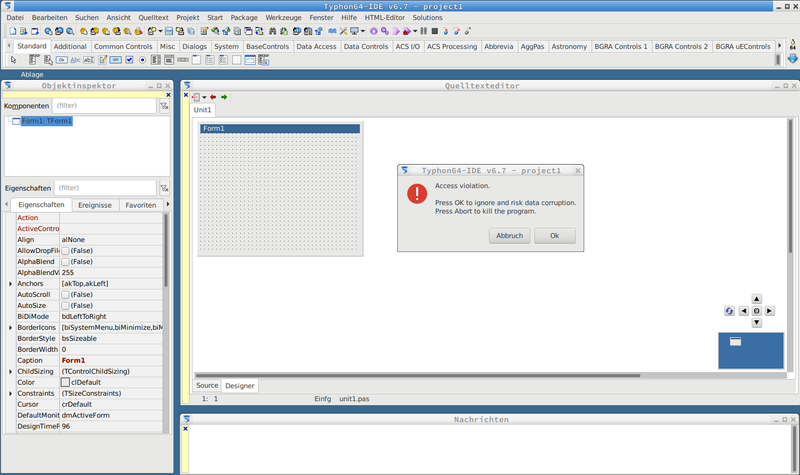 This error doesnt happen, if I compile the program with no optimization. In this case the breakpoints behave normally. 1 month 2 weeks ago	- 1 month 2 weeks ago	#13195 by Matis A. A month of hard work from our LAB TEAM. Last edit: 1 month 2 weeks ago by Matis A..
Where can one find the information on what is new?